Measurements: 3 x 4.6 inches; or 76 x 117 millimeters. Back of card: Solid maroon with two snakes swallowing their tails, each in the shape of the lemniscate (eg, figure eight on its side. See Magician card, above). Book included: Yes, 228 pages, illustrated, 4.5 x 7 inches; or 11.5 x 17.8 cm. Comments: Twenty-five years after his first deck, David Palladini creates this new deck. Here is what he says about it: "As the creator of The New Palladini Tarot, I have tried to infuse as much magic and true meaning as possible into the artwork. But these subtleties will only become apparent and useful after careful and patient introspection. Each door which opens reveals more doors to be opened. Each road traveled leads to more roads and choices. Each new piece of knowledge gleaned from the cards leads to greater knowledge. Remember, your personal input is very important to the successful use of the Tarot cards, and intuition and sensitivity are paramount. The cards can only be a tool of introspection, a mirror for one's own development, an occasional counsel and help. That is the spirit in which I wish my decks to be used. Not as a substitute for spirituality, but as an enhancement of belief and faith." 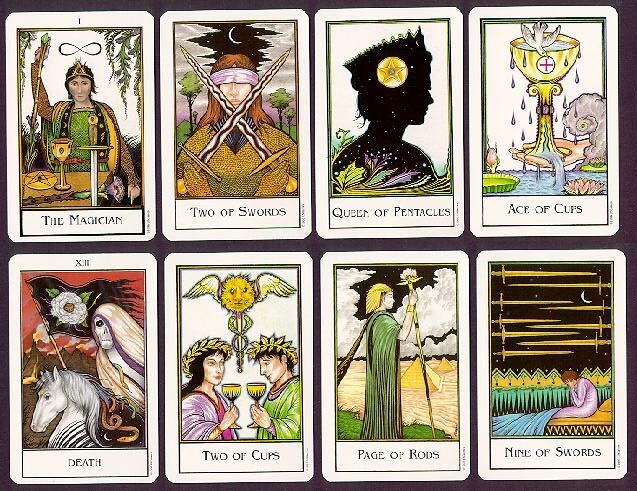 Be sure to see his equally beautiful Aquarian Tarot Deck.